American Theater Company's production of "Xanadu." 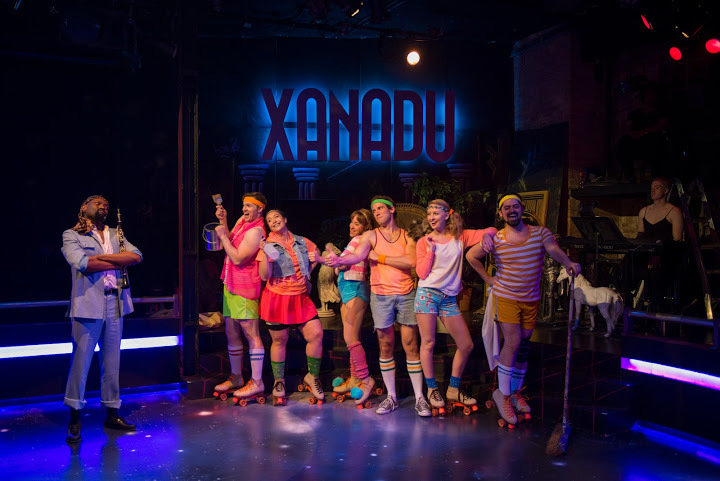 Now through July 17, the American Theater Company will be presenting the classic camp musical Xanadu. It's the first production of its Legacy season, presented as a tribute to ATC's late Artistic Director PJ Paparelli, who was a huge fan of this camp classic, which is based on the 1980 Universal Pictures film, also called Xanadu. The production has music and lyrics by Jeff Lynne (of E.L.O.) and John Farrar (of British group The Shadows, and producer of Olivia Newton-John's work) and the book is by playwright Douglas Carter Beane. Xanadu takes place in Venice, California in 1980. Struggling artist Sonny Malone seeks to create his own version of the American dream by renovating an abandoned warehouse into a venue for world-class entertainment – a roller disco! He manages to succeed with the help (and hindrance) of some Greek deities. A hilarious and modern update of the 1980’s camp classic, Xanadu celebrates the artist’s muse, even when it comes from the most unlikely of places. We saw this when it was on Broadway and it was a very fun (and funny) musical. If you are a fan of the 1980's, of camp, and of roller-skating, then this will be a sure fire winner for you. 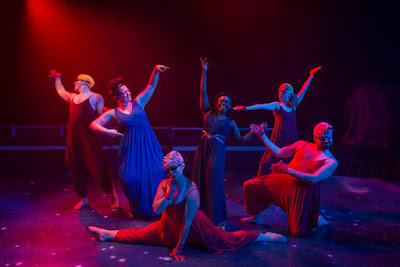 The Sirens in American Theater Company's production of "Xanadu."